With multiple controversial topics on the agenda and coming on the heels of last weeks shakeup election, Davidson Town Hall is sure to be packed on Tuesday. Public comment at the beginning of the meeting can be used to address thd Hotel and the PSB items. There will be a special public hearing on the text amendments. Meeting starts at 6pm. Grab a friend and head to Town Hall early to get a good seat. Previously, aShortChronicle told readers that the outstanding provisional and mail in ballots for the local elections would be counted today at 5pm. That was the plan as of last Thursday. However, it looks like the waiting will continue a little longer. According to the Mecklenburg BOE office, a quorum could not be gathered for the counting and it has been rescheduled until Wednesday at noon. Also, the number of outstanding ballots to be counted is getting narrowed down. Per the BOE, there are 6 additional mail in ballots and 12 provisional ballots for Davidson. 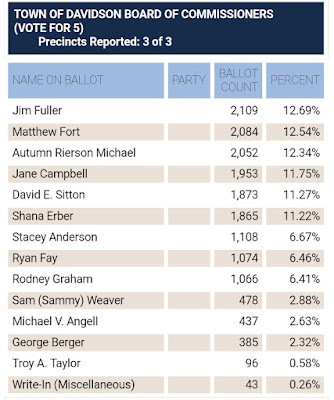 Depending on the breakdown of the provisional ballots (whether they are "full" or "partial" ballots) there may or may not be enough to swing the election results for 5th and 6th place between David Sitton and Shana Erber. A "full" ballot is one where the person voting is maybe in the wrong precinct but still receives a ballot for all their races - going to Town Hall instead of Hopewell on election day if you live in River Run for example. You would get a full Davidson paper ballot and all of the choices and races would be there. A "partial" ballot is where someone went to the wrong precinct on election day and only gets to vote on the items that would have been on the ballot in their correct precinct. An example of this might be a Davidson voter who went to a precinct by where they work in Charlotte thinking they could vote there. On election day that Charlotte precinct would only have paper ballots with the Charlotte races and the CMS school bonds. The Davidson voter could only vote for the school bonds because it is the only race that would have been on the ballot in Davidson as well. So, right now, with only 8 votes separating the candidates it looks like there could be enough votes to swing the race outcome, but the odds are unlikely that it will. After Wednesday comes "canvasing" on Friday, and then if anyone wants a recount it can be requested then. Regardless of Wednesday's outcome, that's certainly a possibility. This transformative election for Davidson provides the opportunity for this new group of elected officials to make their mark on trust and transparency in local government. Trust and transparency, or the lack thereof, in Town Hall was the underlying theme that drove this past election and moving swiftly to take definitive action to improve public perception on that front will be critical to the new Board's success. 1. Pass a resolution stating that neither the mobility bonds approved this cycle nor any other Town funds will be used to support land acquisition or use of eminent domain for the Potts-Sloan-Beaty connector project or any multi-use path construction along Potts street. 2. Publicly instruct the Town Manager that town communications should no longer be conducted in a manner that resembles a coordinated information campaign unless it involves improved public safety. Press releases should come out immediately after relevant events (3 business day delay maximum). 3. Commit to providing a public access terminal for public records at Town Hall. Also, instruct staff that if records requests compiled by the Town have documents pulled due to any valid reason under public records law, state the number of documents that were withheld due to said reason. 4. Pass an updated Rules of Procedure that allows two Commissioners to add an item to a regular meeting agenda. Currently, agenda items can only be added if the Mayor and Town Manager agree. While this probably won't be an issue under the new administration, it is still good public policy. Agendas should also be structured such that the most pressing issues for the public are discussed first to accommodate citizen schedules. Less important agenda items or presentations should not be used to draw out meetings in hopes the public will leave prior to getting to the items of public concern. 5. Pass a resolution or add to the Rules of Procedure stating no informal polling of commissioners via email or otherwise will occur prior to a public vote on any subject. Polling violates the spirit of open meetings law and makes a farce of the citizen public comments at the meetings themselves. 6. Eliminate or strictly constrain 2x2 meetings with staff and Commissioners done to avoid public meetings law. This is where staff meets with Commissioners in groups of no more than 2 elected officials. More than 2 would require it be announced as a public meeting. These 2x2 meetings should be eliminated completely for planning related topics or anything requiring a public hearing. All other topics discussed in 2x2 sessions should posted on the Town website. 7. Post all development projects in discussion on the Town website under a pre-proposal section. 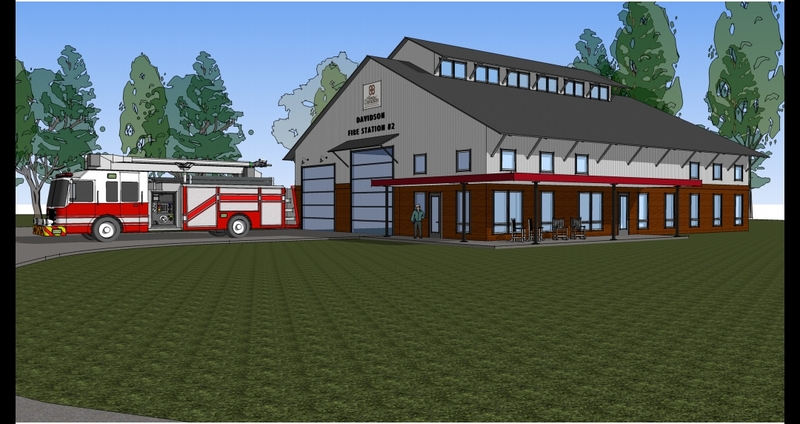 Townspeople should no longer be surprised by proposals that show up on the town website only when a fully completed proposal is submitted often after months of discussion and negotiation with staff. This would also apply to planning related changes initiated by staff or electeds. This would provide a single place where citizens could find notice of new projects or potential zoning rule changes. These changes or some variation would cost nothing and would give citizens a good feeling about where the Town is headed when it comes to greater transparency in government. They would also help prevent any slippage back towards the behaviours that got us to the point of falling Citizen Survey scores when it comes to trust in local government in the first place. After the electoral defeat the current Davidson Board took on Tuesday, one would think, one would hope, they do not do things on their way out the door to further inflame tensions in this town. 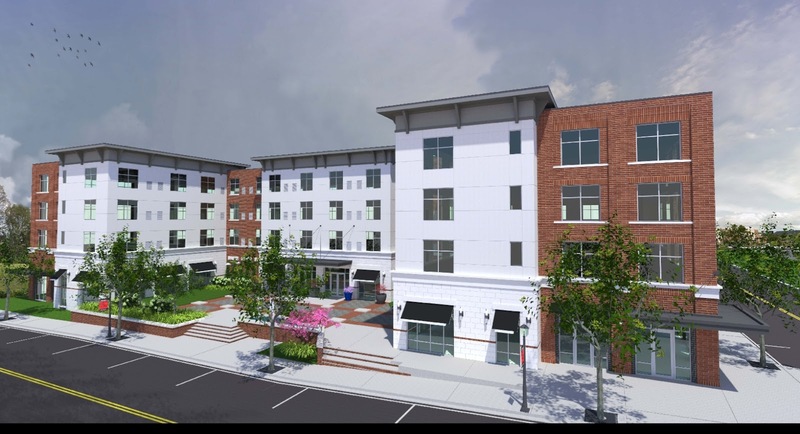 However, they will have the chance to pour gasoline on the situation this coming Tuesday with a scheduled vote on the proposed Griffith Street Hotel. The vote was tentatively planned prior to the election, but now definitivy appears on the agenda for this coming Tuesday - ensuring another packed Town Hall for another contentious decision by this outgoing Board. Approving this zoning change as lame duck electeds, a change that was unanimously voted down by Davidson's Planning Board, would be an ignominious way for these elected officials to leave office...whether they stood for reelection or not. The election results on Tuesday clearly showed the voters of Davidson want a change in direction. They want a change in how things are done. They want a change in what it means to listen to the public. This Board has one last chance to get this right. Conversely, it would be a disservice to the town for the current Board to move this project forward under these circumstances. If they do, it will be what they are remembered for by many for a very long time. It will be their albatross. That is a certainty. Let's hope they do the right thing for this community. Let's also encourage them to do so. Before Tuesday, send them one last message to politely ask them to not move this project forward. There is no compelling reason for them to do so, and there are many compelling reasons to not. Back in 2010 Davidson's Board was considering making a unilateral change to the Town charter that would have changed elected terms from two years to four years and staggered them so only three elected officials would be up for election every two years. The mayor and two commissioners would be elected one cycle for four years and two years later the other three commissioners would be elected for four years. The initial plan was for the Board to make this change without even going to the voters for approval. If that had gone through for the 2011 election as proposed, this past cycle would have been a three commissioner cycle. The job of Mayor would not have been on the ballot. Assuming the other things over the past few years remained the same, John Woods would have won in 2011 and again in 2015 and be mayor until 2019. On the commissioner side it is harder to know exactly what would have happened, but by our estimation Rodney Graham and Stacey Anderson very well may have been two of the three seats up for election this year. 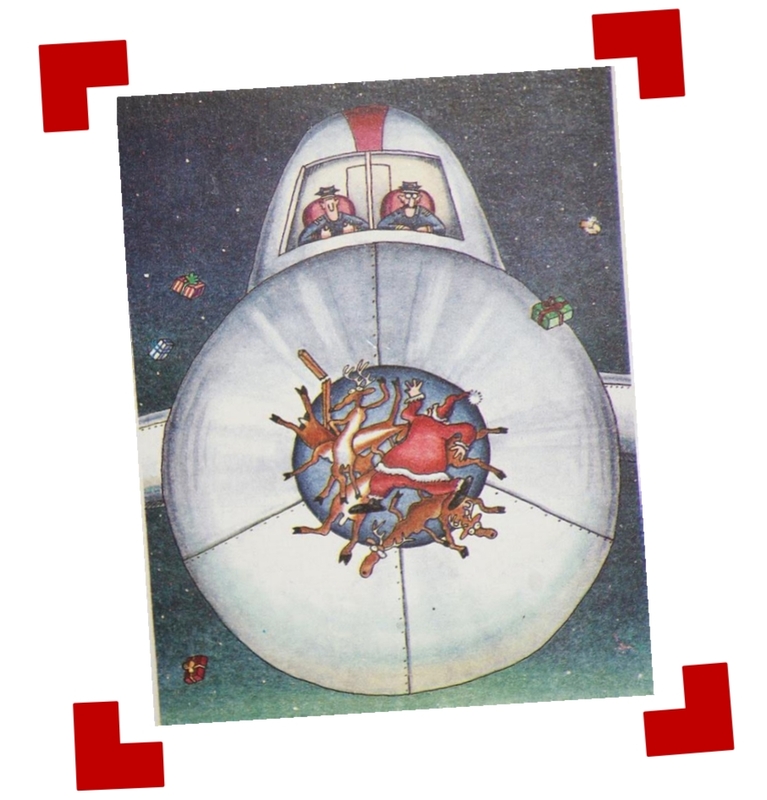 Who would have been in the third seat is less certain. This scenario requires making some assumptions that may not be true, but it is certainly possible. The point being that what happened this cycle would not have been possible if that 2010 effort by Town Hall had been successful. In fact, back in 2010 proponents of 4-year staggered terms argued that preventing what happened this cycle was exactly the reason to implement staggered terms - to prevent the status quo from changing in a single election. The issues and candidates elected this cycle prove why the proponents of 4-year staggered terms were and are flat wrong. Sometimes, major change is necessary. Sometimes, waiting two extra years is two years too long. Sometimes, it needs to be done now. This election was one of those times. So, with that in mind, here is what aShortChronicle thinks of our entire new group of electeds. Mayor - Rusty Knox winning an outsized victory was a great thing not only for him, but for the town. In a three way race, it was very likely the winner might have won with less than 50% of the vote. After an at times contentious election season, that outcome would have been very bad for the requisite post-election fence mending and hatchet burying that is needed. As Mayor, Knox is well positioned to do that. His vote total was almost equally split between precincts 127 and 206 when adjusted for population differences. His opponents in the race were much more skewed towards one precinct or the other. 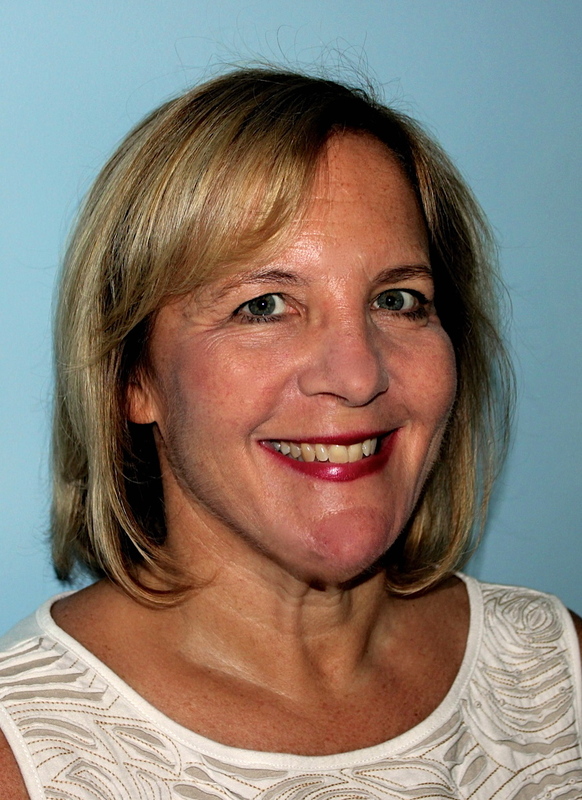 As for the policy and problem solving aspects of a Knox led administration, aShortChronicle has a high degree of confidence Knox will work very well with the new Board to accomplish the goals of reigning in development and protecting Davidson's small town charm. 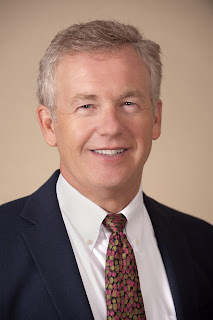 Commissioners - With Jim Fuller, Matthew Fort and as of this writing, David Sitton, all coming from the list of candidates aShortChronicle recommended, things are looking better for the issues aShortChronicle cares about most. ho confident debacles like the Catalyst Project, the Beaty Street RFP, the RAP mass rezoning, and a non-voter approved new Town Hall will not be repeated. With Shana Erber trailing Sitton by just 8 votes and with as many as a few dozen provisional and absentee mail votes to be counted the final result could change. However, that would not change how aShortChronicle feels about the results. While Autumn Michael and Jane Campbell were not on the list aShortChronicle recommended for Commissioner, it is clear they are exceedingly qualified. 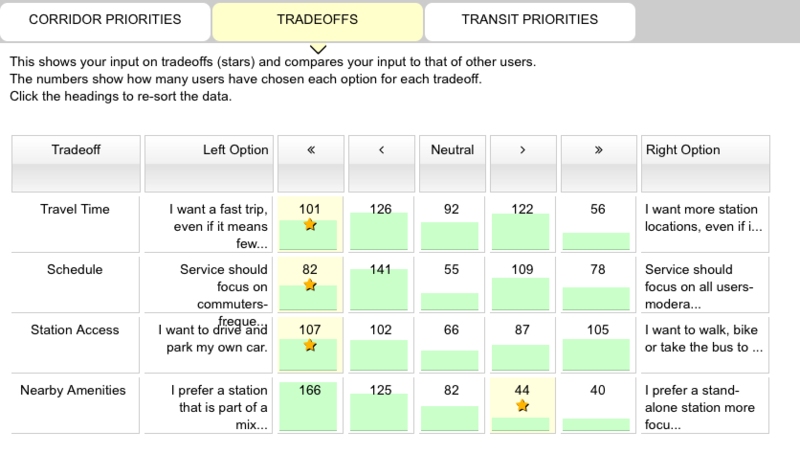 The only reservation was the uncertainty around the Mayoral race. If things had gone differently in that race aShortChronicle was not sure Campbell and Michael would push as hard for some things as this blogger would like. Now that the Mayoral question is answered, it is clear they will both bring great experience to the Board. During the campaign Campbell's comments on fiscal issues were on the mark and Michael will bring great experience in both land conservation and historic preservation. 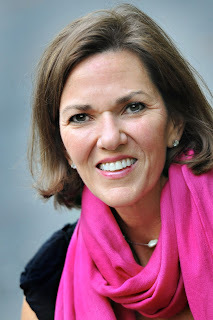 With Campbell specifically, it should be noted that she also really put in the effort going door to door (even stopping at aShortChronicle HQ), and it seemed like she worked every hour of early voting at Cornelius Town Hall. That definitely shows a lot of commitment and deserves being noted. Bonds - All three of the first ever GO Bonds for Davidson passed easily. While aShortChronicle recommended against them, that too was as much out of an abundance of caution regarding the election as anything else. Knowing who will be approving spending the money over the next two years gives greater confidence that crazy things won't be done to jack up tax bills. aShortChronicle strongly encourages the new Board to make sure that does not happen and ensure Bond money isn't used to support things like the use of eminent domain, particularly along Potts Street. All in all, this election turned out almost exactly the way aShortChronicle thought it would regardless of who was on the recommendation list, and looking ahead, great things are expected from everyone in this new group of elected officials. DAVIDSON, N.C. – The Town of Davidson invites all citizens to Davidson Town Hall on Saturday, November 11 at 11:00 a.m. to commemorate Veterans Day. The program features keynote speaker Retired Navy Captain Robert Cameron, Davidson College’s a cappella group, the Delilahs, the Hough High School Wind Ensemble and Junior ROTC, and the participation of many community members. In honor of Veterans Day, please gather on Sunday, November 5 at 2:00 p.m. at Mimosa Cemetery on South Street to place flags on veterans' graves. Volunteers from Hough High School’s Junior ROTC and others will visit all town cemeteries. All are welcome to participate. aShortChronicle checked with the Mecklenburg BOE on Wednesday to get updated information on the possible impact of outstanding votes on the tight race for the 5th place finish and the final seat on Davidson's Board of Commissioners. 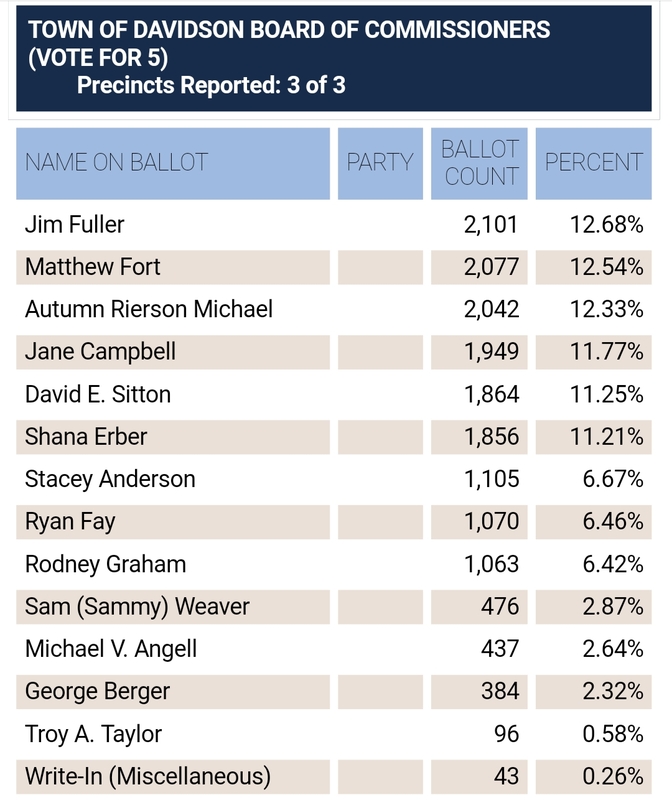 David Sitton currently holds an 8 vote lead over Shana Erber (both candidates supported by Save Davidson). There was a bit of confusion Tuesday evening as returns came in due to the fact that Davidson actually spans two counties. The MeckBOE site only showed the two Mecklenburg precincts 127 and 206. However, it did not include the Davidson Pointe neighborhood which is in Davidson's municipal boundaries but is in Iredell County. Davidson Pointe is part of Davidson proper and not in the ETJ, so residents can vote in Davidson elections. However, historically they almost never do. This election was different with 70 ballots being cast. When those votes were added to the Mecklenburg total, Sitton edged ahead of Erber to get the 8 vote lead he currently has. That does not mean the contest is over however. According to the Mecklenburg BOE there are 12 provisional ballots outstanding and up to 30 possible mail in absentees that did not come in prior to early voting close on Saturday. Those will be counted Monday at 5pm. The canvasing date was supposed to be this Friday but due to Veterans Day, the deadline is now Monday. To add even another wrinkle, interestingly, if a mailed in ballot comes without of post mark after election day it doesn't get counted at all. Apparently, the post office does not post mark everything anymore. 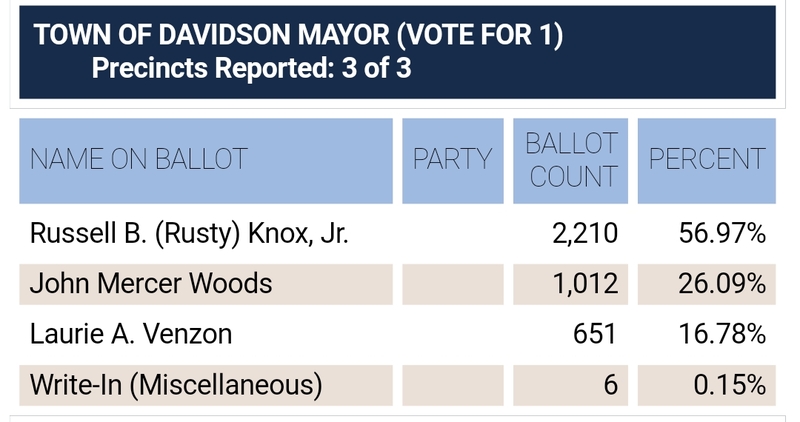 With somewhere between 12 and 42 ballots still to be counted on Monday the results for the final seat on Davidson's Board certainly could still change. Did not check with Iredell to see if there were any to add to this total. DAVIDSON, N.C. – On Thursday, October 26, the Continuum (formerly known as MI-Connection) Board of Directors met to hear the results of the external audit and review financial results for the first quarter of FY 2018 (ending September 30, 2017). April Bell of auditing firm Dixon Hughes Goodman shared results for the fiscal year that ended June 30, 2017. She stated that Continuum is seeing a positive trend in financial results. During his review of the financials, Continuum CEO David Auger shared that revenue is down 2.3% in Q1 2018 versus Q1 2017. Expenses are down by 0.59% in Q1 FY 2018 versus Q1 FY 2017. EBIDA (Earnings before interest, depreciation and amortization, a key metric used by cable operators to measure performance) decreased by 12.03% by Q1 FY 2018 vs. Q1 FY 2017. EBIDA for Q1 FY 2018 was $148,605 lower compared to the same period a year ago. Most of this variance was due to the budgeted name change. Marketing expenses year-over-year were $114,157 higher. Another significant reason was that in the first quarter of last year, advertising revenue was $80,647 higher due to state and national political advertising buys and the fact that this is not a state/national election year. The next meeting of the Continuum board of directors is on Thursday, January 25 at 6:30 p.m. at Davidson Town Hall. Bonus Observation: The referenced meeting occurred 12 days ago. The above press release from the Town should have been released before the election, but it wasn't. That kind of thing should be a very easy one to fix for the new administration come December. Election 2017 in Davidson will be remembered as the year a political earthquake struck North Mecklenburg's smallest town. 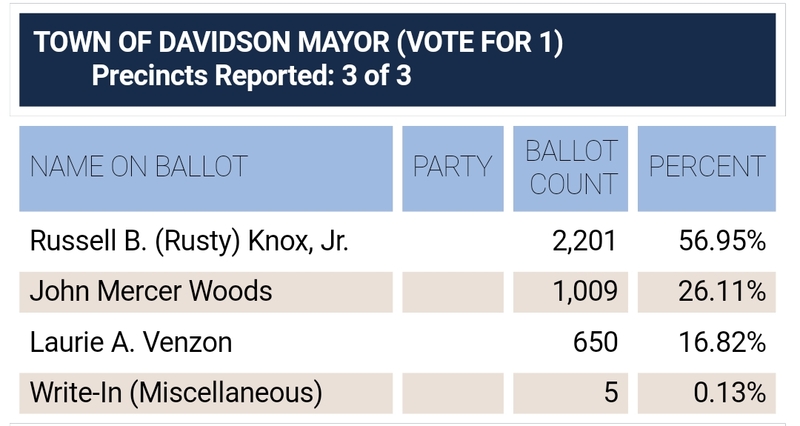 With preliminary results in from the State BOE website, Rusty Knox has won a major victory over incumbent Mayor John Woods and former Mayor Pro Tem Laurie Venzon. 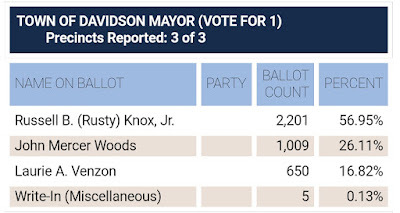 Receiving just under 57% of the vote gives Knox a clear mandate to lead the town. In fact, it is hard to overstate the impressiveness of this victory. Receiving a an absolute majority of votes in a 3 way competition is hard. Doing so as handily as Knox did on Tuesday against two well known opponents is a mandate. In the race for Commissioner, things are equally as startling. Going into Tuesday the Davidson Board was guaranteed 2 new Commissioners due to open seats left by Beth Cashion and Brian Jenest not seeking reelection. Coming out of Tuesday, Davidson will be getting 4 new Commissioners as both incumbents Stacey Anderson and Rodney Graham lost in their bids for another term. With the difference between 5th and 6th place being only 8 votes the final outcome could be in flux if there are enough provisional ballots, but here are the results as of midnight Tuesday. 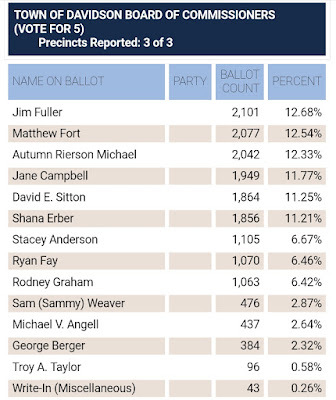 Incumbent Jim Fuller was the top vote getter. 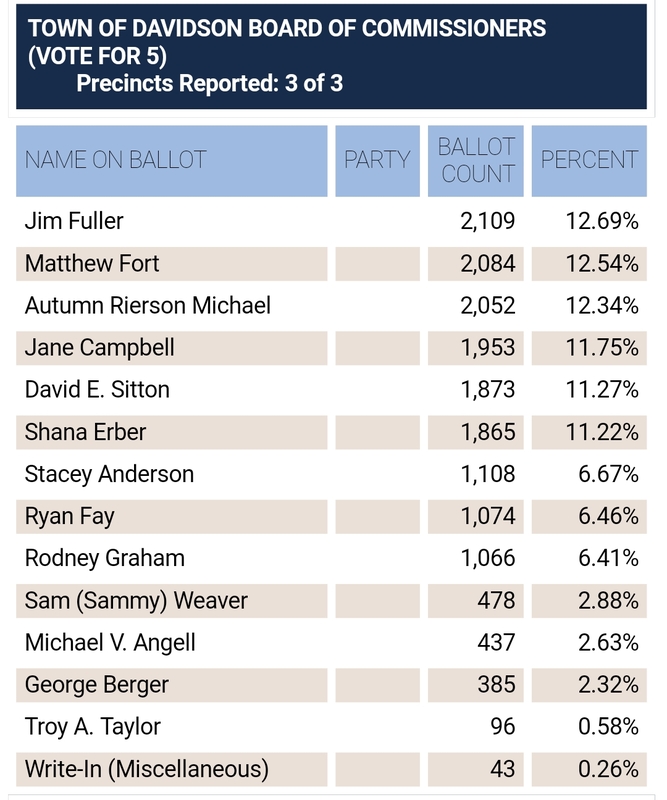 However, with only 237 votes separating Fuller and 5th place finisher David Sitton, the new Board has a solid base of support under all members.. After 6th place finisher Shana Erber, support falls off significantly including that for incumbents Anderson and Graham. Like the results in the Mayoral race, this solid victory for new blood candidates shows a clear desire for a change in direction at Town Hall. On Wednesday, when there is a bit more time to reflect on what this all means, there will be some more interesting threads to analyze in this evolving story. However, tonight congratulations to all the candidates are in order. Running for office is hard and everyone doing so should be commended. This was a particularly tough campaign with so many candidates and a significant amount of controversy. Here's hoping everyone involved sees these results for what they really mean and acknowledge it is time to bring this community together and move forward. Early voting closed Saturday and clearly something is happening in Davidson. According to the State Board of Elections website, over 1500 Davidson voters have cast their ballots already. That's setting this cycle up to very likely be a record setting contest based on the raw number of votes. There have also been several hundred voters participating for the first time in a Davidson election, and hundreds more returning to the polls who haven't been to a municipal election very often in the past decade. Those are all positive things no mater how Election Day turns out. However, in the final days of #DavidsonElection2017, it hasn't all been positive energy and good vibes. No, unfortunately local politics can be about as friendly as a knife fight in a phone booth, and those in town wishing to keep the reigns of power tightly in their grasping fingers are proving that's the case. Just like in the 1980s movie "Absence of Malice" where an innocent man is wrongfully attacked by officials using a compliant media, we've seen a concerted and coordinated effort using the media and other levers of influence to smear the Save Davidson citizen activist group here in town. It started with a Charlotte attorney filing an anonymous "complaint" to the State BOE and sending the dubious story to the media. The Charlotte Observer dutifully lapped it up and printed it. The Davidsonian student publication at Davidson College did the same. The student paper also made multiple references to other anonymous complainers questioning Save Davidson's use of an attorney who is a campaign finance expert but who also happens to live in Raleigh. The student paper referenced even more anonymous people indicating those anonymous folks might be issuing "cease and desist letters" - whatever that means is unknown. That's a lot of anonymity in the media for the last two weeks before an election. While all of this was clearly initiated as just a bunch of political theater, it did get the Save Davidson leaders' names out there in an unfavorable light. And let's be honest, that was the whole point wasn't it? The point all along with all this anonymity was to smear hard working, caring people who just want to bring more transparency and open government to Davidson. The irony of anonymity being used to attack transparency should not be lost on anyone. Mayor John Woods even took it a step further. In a recent video Woods can be seen giving a speech at the Pines. He's talking about the anonymous complaint and then talks about "dark money" as if Save Davidson was some sort of ominous group that needed to be feared. It might seem comical, but there's nothing at all funny about a sitting mayor speaking to a group of seniors in a way designed to manipulate rather than inform. Then this weekend a group of Town Hall supporters put out a letter designed to once again cast aspersions on Save Davidson. This time, they weren't anonymous. 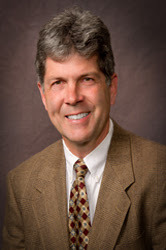 They included the former mayor, Randall Kincaid, who was mayor when Mi-Connection was bought as well as a few other prominent names in Davidson's past. The clear undertone was that they, and only they, were the arbiters of who was worthy - and who was not - to lead the town. The views espoused in the letter made it clear that everything was just fine at their Davidson Town Hall, and if you don't agree, then you just don't understand. All of that was a lot of work, a lot of time, effort, and money spent by a lot of people (often anonymous people) to keep the status quo. If you haven't voted already, keep all of that in mind when you head to the polls on Tuesday. Ask yourself why would the status quo fight so hard and so dirty against a group of residents to keep their hands on the reigns? Ask yourself that question, then vote for change. With early voting ending on Saturday, a couple of things are certain for Davidson. This 2017 race will have higher early turnout than the entire vote total in 2015. The early vote in 2017 will also be at least 3 times the early vote total in 2013. By the end of Thursday, over 1000 early votes had already been cast or had ballots requested by Davidson voters. With Friday totals at Cornelius Town Hall showing over 500 ballots cast and Saturday yet to come, it is very likely Davidson sees between 1300 and 1500 total early votes. It is hard to know how much this increased early vote will cannibalize the election day turnout, but as reported earlier there has been a high percentage of new/infrequent voters so far this election. Through Thursday that was running at about 50% of early voters. Assuming more regular voters turnout as expected and with the heightened focus on this election in general likely to continue strong new voter turnout, Davidson could be looking at significantly higher turnout overall than normally seen. 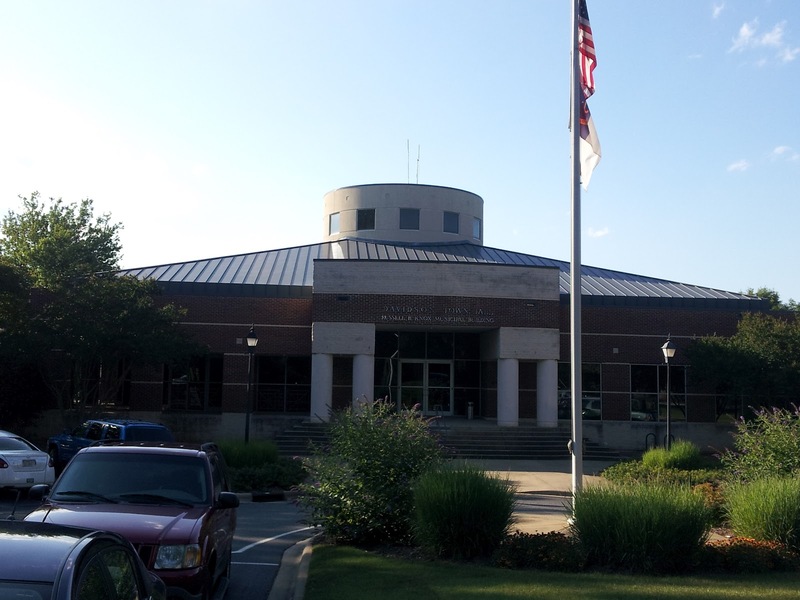 Last chance early voting is today from 10am - 1pm at Cornelius Town Hall. Grab a friend and head to the polls. Vote to be the change. DAVIDSON, NC – The Town of Davidson is pleased to announce the second annual “Cookie Crumb Trail” as an effort to introduce citizens and visitors to Davidson businesses, kick off the holiday shopping season, and support our local retailers. A maximum of 100 tickets will be sold and each ticket guarantees one cookie per location. On November 4, please check in at the table in front of the Village Store at 110 S. Main Street to pick up your passport and cookie collection bag. The passport will include a list of all participating businesses and a map. Participants who have not pre-paid before November 4 can pay at the table until supplies last. Our core values state that “Davidson’s economic health is essential to its remaining a sustainable community, so town government will judiciously encourage new business opportunities.” The town’s economic development department focuses on business retention and this event will familiarize participants with our local businesses in time for the holiday shopping season. All proceeds will be donated to the Davidson-Cornelius Child Development Center. DAVIDSON, N.C. – Citizens are invited to a drop-in-style public meeting hosted by the Charlotte Area Transit System (CATS) on Wednesday, November 8 from 6:30 to 8:00 p.m. at Davidson Town Hall to learn about the transit vision for the north corridor of the county. 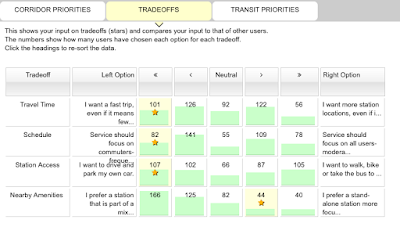 CATS wants to evaluate the most effective rapid transit mode and alignment that best matches the region’s current land-use and transportation values to update their 2030 Transit System Plan. Please attend and provide feedback. The proposed LYNX Red Line will connect the communities of Mooresville, Davidson, Cornelius and Huntersville with Charlotte. Thursday, November 9, 6:00-8:00 p.m.
aShortChronicle told readers previously that turnout was way up at Cornelius Town Hall for the first weekend of early voting. 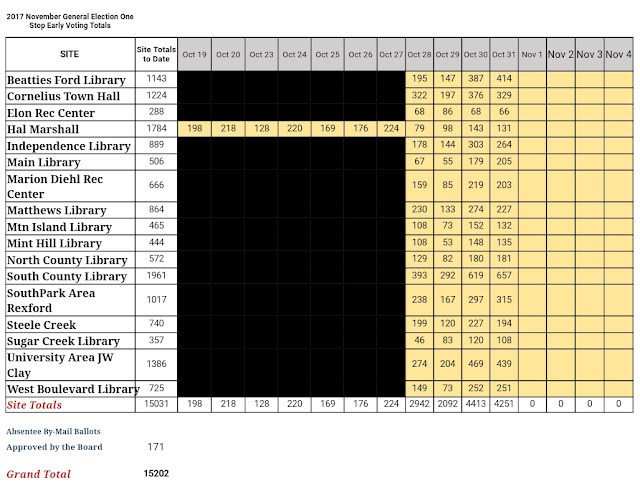 Well, the high turnout has continued at that location through the half way mark ending Tuesday. See below. The total turnout of 1224 voters at the Cornelius site by the halfway point shows early vote turnout running at 425% of the turnout in 2015. That's a big jump and a testament to the interest of voters this election cycle. Detailed turnout data is also now available that provides some interesting insights into the internal dynamics of the electorate so far. Compared to 2015 and 2013, at the halfway mark 2017 has already blown away the totals for the entire early voting period for those previous elections. The totals for Davidson in 2015 and 2013 were 194 and 415 respectively. At the halfway point as of Tuesday, 658 Davidson voters had gone to early voting or already returned their mail in ballots. However that is not the big takeaway so far. The biggest takeaway in Davidson is that first time voters are turning out in relative droves. Of 658 Davidson early and mail-in voters through Tuesday, 243 are voting for the first time in a Davidson election going back 3 cycles. 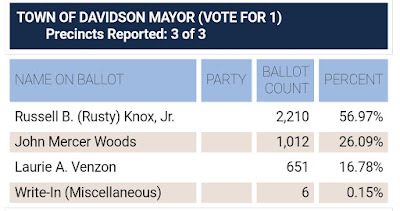 When voters who have voted in just 1 Davidson election out of the last 3 contests going back to 2011 are added to that total, 372 voters are either first time voters or what could be classified as newer/infrequent voters. That is a stunning 57% of the total so far. If turnout among this type of voter continues at this pace, the electorate in Davidson will be very different than in years past, and that should be a good omen for the challengers in the race for Commissioner in particular. Something has spurred this many new voters to decide to go to the polls. It is just a question of what. Maybe, it is the fact there are actual choices this time with plenty of qualified candidates. Maybe, people are finally fed up with how Town Hall is operating. Maybe, the same people who have given the Town falling scores on the National Citizen Survey when it comes to trust in local government have finally decided to do something about it. Or, maybe people are getting out because they approve of the things the incumbents have supported like the failed Catalyst Project, the failed Beaty Street RFP, the unpopular Rural Area Plan mass rezoning, or the controversial Griffith Street Hotel, but somehow aShortChronicle kind of doubts this last one. Recently, in a bid to squash the challenge coming from these new candidates, supporters of business as usual at Davidson Town Hall have been casting about for "red herrings" - something to divert people from the real issues at hand in this election such as growth, transparency in government, and maintaining Davidson's small-town character. These Town Hall supporters have taken to attacking some of the newcomer candidates' short tenure in town or their lack of a voting record in town elections as evidence they are somehow unqualified or don't care about Davidson. One has to wonder if the same Town Hall supporters maligning these candidates for having the audacity to get into the political ring, think the same thing about these hundreds of new voters. It is a safe bet they probably do. They would probably prefer these voters stay home. Here at aShortChronicle we take a very different view. Since the beginning of this blog a primary objective has been to encourage people to get involved in civic life. We've encouraged people to participate whether they are a newcomer or long-time resident. We have regularly encouraged people to get out and vote. The number of new voters already this cycle is inspiring. The number and quality of new candidates should be cheered, not sneered. Do not listen to the naysayers who want nothing more than Town Hall's flawed decision making to continue. Instead, get out and vote.